After the death of her husband, writer Sonali Samarasinghe has worked to change the climate of free speech in Sri Lanka from miles away. 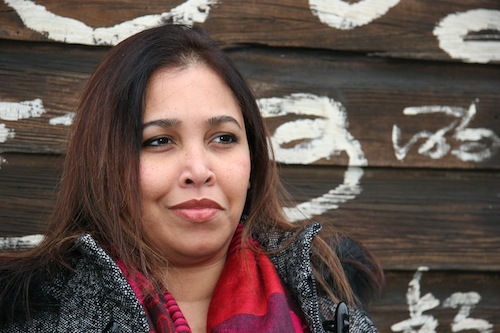 Sri Lankan writer Sonali Samarasinghe outside of City of Asylum/Pittsburgh's House Poem. Photo: Joshua Barnes. Sri Lankan journalist Sonali Samarasinghe has been hooked on investigative reporting ever since she experienced the frustration of working as a human rights defense lawyer. She wanted to change the Sri Lankan public’s opinion about their oppressive government, so she started writing for The Sunday Leader, a weekly publication run by Lasantha Wickrematunge, the editor who years later would become her husband. But running the small, independent publication was not easy. Faced with government restrictions on advertising for their sharp content, it was difficult to know when they could print the next edition. Often, Samarasinghe and her husband didn’t take a salary in order to pay their journalists. Besides the economic struggles, the Sri Lankan President, Mahinda Rajapaksa, was threatening Wickrematunge. “I will destroy you” he said one day over the telephone. Consequently, when Wickrematunge was killed on January 8, 2009, Samarasinghe had many reasons to blame the government. Soon new threats focused on her and she fled the country. 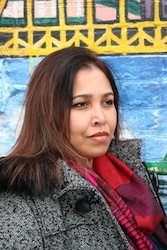 Currently, Samarasinghe is a resident writer and professor at Ithaca College in New York through the City of Asylum program. Her work has been continually awarded for its fearless honesty; Samarasinghe received the PEN/NOVIB Freedom of Expression award in 2009, was a Harvard Neiman Fellow in 2010, and most recently received the Images and Voices of Hope Award for Print and Digital Journalism in 2011. In this interview, Samarasinghe discusses the current climate of free speech in Sri Lanka, the government’s involvement in Lasantha Wickrematunge’s death, and the risks associated with her writing today. How did you and your husband, Lasantha Wickrematunge, meet? I first met Lasantha in 1988 when I was a reporter at The Sunday Times newspaper in Sri Lanka and he was a columnist. It was much later that we became good friends. Lasantha and I are both lawyers so we would also meet in the corridors of justice, as it were. Lasantha started The Sunday Leader in 1994 and he asked me to join him because I was a part-time journalist. I had a successful career in law in Sri Lanka but later, as I was also a resident of Australia, I moved there. Four years after he started the newspaper, in 1998, I came back to Sri Lanka for a month to attend to the construction of my house and Lasantha asked me to join him again. I accepted, with the caveat that I would return to Australia in one month. Then I got hooked, especially on the investigative side. One month turned into eleven years. Before your husband’s passing, was there a particular story he was working on that drew a lot of attention? Or was it a particular article or disagreement with President Mahinda Rajapaksa? Lasantha was the Editor-in-Chief of The Sunday Leader and its public image. Though I was the publication’s primary writer and conducted and wrote the most prominent investigations, Lasantha was the driving force behind the newspaper. As a result, he became very powerful in the political arena. The government feared The Sunday Leader because it was fearless. By late 2008, the government was renewing its war efforts and preparing for a final offensive against the Tamil Tigers. It was clear they didn’t care about civilian casualties as they proceeded with their scorched-earth policies and their indiscriminate aerial bombardments. The government publicly said that hospitals and schools outside the no-fire zones were legitimate targets and that anyone with a dissenting voice was a traitor. In this scenario a politically powerful journalist like Lasantha was an enemy who would expose their human rights violations. It would jeopardize their war efforts. Throughout the week after Lasantha was killed, we saw the army really storming. Indeed, throughout Lasantha’s career as a journalist he had been the victim of physical assaults and shootings. There were also several attacks on the newspaper; our presses were burned down twice. On every occasion, the government was behind the attacks. There never was a serious police inquiry into any one of them, and no one was ever charged. Lasantha often talked with me about the likelihood of the government killing him. He was not afraid. So in December 2008, when the president’s brother, Defense Secretary Gotabaya Rajapaksa, went to court against the newspaper, filing a defamation suit based on a very weak case, Lasantha felt the groundwork was being laid for his murder. After all, why prosecute someone if you’re planning on killing them? In fact, Lasantha told me he had conveyed to President Mahinda that, as part of the defense of his case in court, he would be tabling a wealth of evidence of corruption and other excess on the part of the government and the Ministry of Defense. You have written letters to the president and asked for an investigation into your husband’s case. Have there been any advances? At the start, the president had four investigative teams, and they never came to anything. At one time they blamed the Army Commander and accused him; The Hindu newspaper in India quoted Gotabaya Rajapaksa as saying that it was the army commander. The army commander was later arrested on other charges and imprisoned, but they didn’t file a case against him. Why? Could he turn whistleblower? Why does the government keep stonewalling the investigation? Any reasonable person is entitled to think that they have something to hide. What was the article that Lasantha was charged for? It was an innocuous article about the printing of national ID cards; the Defense Secretary was in charge of that process. We had printed a picture of Gotabaya, and if I remember correctly the last line of the article read “Over to you Defense Minister.” In court, we prepared to show how we had written and published articles that were far more severe against the Defense Minister. I once wrote an article with the title “Gota: The Ugly American” as in the 1958 political novel The Ugly American by Eugene Burdick and William Lederer. Gotabaya Rajapaksa is also a citizen of the United States. Since no cases based on these articles were filed, Lasantha thought that they were using the national ID article as an excuse for something much more sinister. Anyhow, Gotabaya Rajapaksa himself went to courts to obtain the injunction. When he did, the courts were surrounded by army soldiers and a blanket injunction against The Sunday Leader was issued not to write any articles about the Defense Secretary. But, of course, I continued to write about Gotabaya in The Morning Leader. How has The Sunday Leader changed since you and your husband left the paper? Well any newspaper will change with a change of editor – that is inevitable. The moment Lasantha was killed and I left in February 2009, The Sunday Leader was no longer what it used to be — even though it still had a lot of goodwill from before. Lasantha and I were very careful that it be seen as a newspaper working solely in the public interest. Unfortunately, after 2009 it became a newspaper that was widely perceived as pursuing petty personal vendettas. The investigations didn’t go after the big fish but were focused more on other journalists and lower-level politicians. Because a lot of good journalists left, the overall quality also dropped drastically. The management started negotiations to sell the newspaper quite soon after the events of 2009. He eventually sold it to Asanga Seneviratne, a businessman closely associated with the Rajapaksa family. What would your husband think about that—The Sunday Leader being sold to a Presidential acolyte? My husband was a pragmatist, and though he always put himself out there, he would understand. Because the government acts with such impunity, there’s a lot of self-censorship. He’d understand that they’re doing what they feel they need to do to survive financially and make money. But that doesn’t mean he would have done it himself. He would never have allowed it if he were alive. I think he will be very sad and disappointed, but he also saw the other point of view. You were the Editor-in-chief of The Morning Leader. Can you explain your role at that publication and its relationship with The Sunday Leader? The Morning Leader was a weekly national newspaper. We went in-depth with the Sunday paper, but we would have breaking news or exclusives with promise of more in-depth coverage on Sunday in The Morning Leader. The Sunday Leader was our flagship. The Morning Leader was a Wednesday paper. It had a similar editorial policy. Both papers were published by Leader Publications Pvt Ltd. I wrote the political column and the editorial for The Morning Leader and edited the entire paper. I was also the chief investigative journalist for The Sunday Leader and, as its Consultant Editor, went through the articles in the Sunday paper as well. But of course I wrote extensively for The Sunday Leader — sometimes over 10,000 words a week. Apart from the political columns, Investigations, and articles on social issues, I was also a regular columnist for The Sunday Leader. I had a political satire column called Thelma, and another light column called Life with Eve. A few weeks after I was compelled to flee Sri Lanka due to threats, The Morning Leader was closed down. Let’s talk about what happened with your life after your husband’s murder. You left Sri Lanka two weeks later, and once you were out of the country, you created The Lanka Standard. Why did you start this online publication? I started the website only in 2011. As I left the country in 2009 I was still grieving — I still am — and it was a very hard time for me, emotionally. In 2011 I was in New York City as the International Journalist in Residence at the Graduate School of Journalism at the City University of New York. I was also in a great program called the Entrepreneurial Journalism Program. While there that I decided to launch the new website. There were several reasons for this. Firstly I am a great believer in gate-keeping and responsible journalism and I felt the field of digital journalism was sometimes lacking in this area. Because of the ease with which anything could be posted on a blog or website without much checking I really wanted to start a website that was not affiliated to a traditional newspaper but still had that feel and was reliable. There was also so much media suppression in Sri Lanka and journalists were being forced into exile. Many journalists were not finding employment and had to work menial jobs, like at fuel stations. It is really hard for exiled journalists and I thought this could somehow give some journalists, including myself, a platform to write. Have you ever been persecuted for your work in The Lanka Standard? I sent all of these comments and emails to the Committee to Protect Journalists and they were able to trace them. But it didn’t stop. I had to change my server because I didn’t want them to see my personal information. How do you deal with the challenge of protecting The Lanka Standard‘s contributors? I am extremely careful. When I work with journalists who conduct investigations in Sri Lanka, I edit very carefully. There is a lot of redaction, which I never would have done with my own articles. But I feel responsible for their lives. These articles are not as feisty or sharp as The Sunday Leader or The Morning Leader ever were before 2009. They can’t be, because right now there’s so much at stake. We can’t lose any more journalists. Do you have any particular goals for The Lanka Standard? Currently the site is financially and administratively sustained by me, and time and money are my biggest challenges. I have wonderfully generous journalists/writers, who contribute free of charge. Though I’d like to continue, I can’t think too far into the future because it is financially sustained by me. But my goal would be to expand it both in terms of content and subject matter. Focus not only on Sri Lanka, but make it global. I would also like to start a Sinhala and Tamil version of the news website so it can reach the whole of Sri Lanka rather than be accessible only to the English-speaking community. I’m working on a book that is partially autobiographical. It’s also an analysis of the politics of Sri Lanka as the war ended. It shows the difficult relationship between the media and politicians and how that played out. It also shows how public opinion plays out in war situations. I’m also working on a book of poetry. These will probably be published later in the year. Now you are also a writer-in-residence at Ithaca City of Asylum. Has the danger completely disappeared? The tipping point for me was when they killed my husband. It was too much, and I realized that, being in Sri Lanka, I only had two options: I could continue writing and get killed or I could stay back and compromise my principles. I wasn’t willing to compromise anything, so I came here. At least I can write what I want. Obviously, when you’re out of a dangerous situation, you do feel safer. But I’m still very much aware that I have family at home. The government will not hesitate to attack them in order to silence me. I’m well-aware that there are people in the United States who are Sri Lankan diplomats and spies. It’s not something out of a spy movie. It’s real. They show up to events where I speak. I’m careful, but obviously it’s so much better here than being in that hotbed of imminent danger. Let’s talk more about Sri Lanka today. What are the changes you’ve seen in freedom of speech since the war ended in 2009? The biggest change is self-censorship. Nobody wants to write. They’re walking on eggshells all the time. The white van, which has become the real symbol of terror, is still going around. Even as recently as February 2013 a human rights lawyer was threatened. Secondly, many senior journalists have gone into exile, and there’s a depletion of talent. The third change is that the government is still attacking online private publications and their journalists because they are the only entities that the government doesn’t own themselves or through their proxies. An example of this is the online publication, Lanka E-News, their office in Sri Lanka was completely destroyed. Also, the government has taken over many newspapers like The Sunday Leader. Sometimes it’s a personal choice as well. Many journalists want to be with the government because that way they’ll have access to power. For them, accessing the president’s house to have breakfast with him each month, is a sign of success. I know that many people think the president a charming fellow. I once spoke to some visiting Indian journalists in Sri Lanka during the height of the war who had met him. They described him as quite charming. It’s hard because even now, not only a large section of the masses, but even some journalists (who should be more discerning) see the president as a savior of Sri Lanka, as the man who ended a 27-year-war. He’s immensely popular in a lot of places and that’s a very hard thing to fight. What do you think it will take to change that image of him? Will it ever change? History has shown us with all dictators — from Peru, to Columbia, and now Guatemala — that it does change. It takes time, but change will come. Not only change, but justice will come. It always does. Right now the government is doing a good job of chipping away at its own image. The more the president acts with impunity, the more he attacks freedom of expression, the more corrupt he and his family become, the more he and his family act as if the entire country is their personal serfdom, the more it will be detrimental to him in the long run. They may have started by attacking activists, journalists and human rights defenders but they are also starting to attack workers who protest. They are attacking the common man. People will realize that the government is coming closer to their doorstep and change will occur. It will take some time, though. Do you ever see yourself returning to Sri Lanka? I dream of it every day. I really miss Sri Lanka; it is a beautiful country and I had a lovely childhood there. Until recently, it was a paradise to live in. The word serendipity comes from the name Serendip which was an old name for Sri Lanka. I’m only waiting for my country to return to itself. For that we need better leaders. Our present politicians are a sorry bunch of self-serving humbugs and should not be countenanced. The only circumstances under which I can go back is if there is a change of government, or the members of the current government are brought to justice internationally under a war crimes charge. How would a regime change occur? Regime change should and must only come democratically. People power — once our people see the light. I’m a great believer in democratic institutions. Unfortunately President Rajapaksa by some clever political maneuvering amended the Constitution and had term limits lifted so he could potentially be president for life. Under such a dictatorial and ruthless regime free and fair elections are a pipe dream. The Judiciary is controlled by his government, after he illegally impeached the former Chief Justice just a few months ago. All other democratic institutions have metastasized into dangerous tools in the hands of the Rajapaksa family. But one can only hope that the next elections will see a change. Many efforts are made by the Diaspora and by human rights organizations to bring alleged perpetrators of war crimes to justice, but they have failed so far because it’s very, very hard to indict a sitting president who is still popular in his own country. You have to wait until they don’t have any power at all, ask permission from the country to extradite him, and make sure there’s another regime that can come in. Dealing with the International Criminal Court is difficult in Sri Lanka because we have not signed the Rome Statute. Like with Rwanda or former Yugoslavia, we could have a special tribunal set up by the UN Security Council, but then we run into problems because Russia and China will veto it. China is investing so much in Sri Lanka, and they don’t really care about human rights. 2 Comments on "“The Hotbed of Imminent Danger”: Sri Lankan Writer Sonali Samarasinghe"
I would be grateful if you could pass this message to Sonali to Sonali Samarasinghe Wickrematunge. I wrote to you about a month ago and just come back from Sri-Lanka (maybe you did not received my letter. My name is Albert Frey a French person living in Australia since 1966 (born in 22.06.1941. In a few weeks will meet Bob Carr Australian Foreing Minister and expresse my deep concern for the situation in Sri-Lanka. As you know the Commonwealth is due to take place in November and we are working here to ask our government to boycott such event. We are not forgetting you and I can assure you that dictators and boots lickers will have to face justice for their crimes .